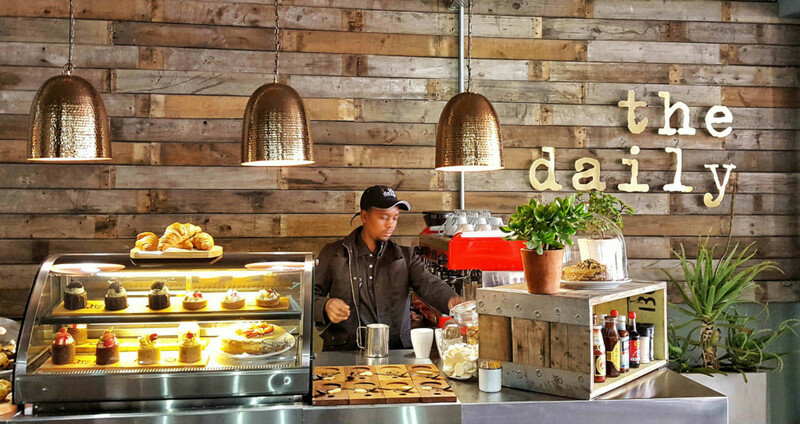 The Daily Coffee Group is a fast-growing and truly South African coffee franchise group. Coffee is our business and we have two tailor-made franchise models – The Daily Coffee Café and The Daily Coffee Express – from which franchisees can choose to offer their customers what The Daily Coffee Group has become renowned for – good coffee and a warm emotion! The Group has the distinction of being awarded the National Franchisor of the Year 2017 award by the National Small Business Chamber of South Africa (NSBC). We’ve also received the NSBC’s South Africa Top 20 Small Business and Entrepreneurship Award for the same year. This franchise model is ideally located in shopping, strip and community malls and similar commercial zones. A coffee café covers more than 100 square metres and on average seats around 60 patrons at 20 tables. Visitor count, on average, is in excess of 5 500 per month. This model offers a variety of seating arrangements to accommodate diverse clientele requirements – large communal tables, smaller individual tables, laptop work areas, even a lazy sit-back-and-relax couch area. With the full The Daily Coffee Café menu available, this franchise model serves all day breakfast, brunch, lunch and other refreshments. The Daily Coffee Café offers space for a lingering me-time breather, a homely corner to catch up with a friend, an appealing ambience for business discussions and a relaxed setting to treat the family. These coffee cafés have become destinations of choice where clientele experience genuine hospitality in a distinctive and inspiring setting. This franchise model is suited for sites ranging between 60 – 100 square metres. The design includes a compact kitchen and the menu offering consists of coffee, other drinks and a variety of grab-and-go food such as pastries and gourmet sandwiches. The Daily Coffee Express is ideal for customers who are pushed for time, yet appreciate and expect quality. A smaller seating area (around five tables) and laptop work stations are available for patrons who require a pause area and who do not need to be entertained or attended to. The ideal location would be in or near to busy office blocks, business parks, street-facing sites and similar customer-on-the-go locations. We are different to others. Our coffee cafés offer a professional, yet intimate ambience and a coffee experience where traditionalists, modernists, purists, the finicky and the easy going feel equally at home. It is not your average coffee shop – it is informal and casual, yet with a corporate elegance and flair. Our coffee cafés transform into what individual patrons want them to be. Those who prefer seclusion find it in the easy ambience. Want to have fun? No problem! Looking for a space for a business discussion? Our upmarket feel and our soothing coffee will facilitate the clinching of the deal. Inspired by the café life so prevalent from Cape Town to New York, our modern and striking, yet subtle interior, together with its hassle-free setting uplift, relax and prepare customers for a refined experience, whether on their own or in a group. Key to this is the pleasing and much talked about New-York-meets-Karoo theme of all our coffee cafés which takes patrons on a visual journey where they can expect to come across hints of upmarket Big Apple urbanism, combined with shades of customary down to earth South African appeal. Our seductive and tantalizing menu whispers quality and value for all tastes and requirements. What usually start off as spur-of-the-moment visits, soon change into coming-back-for-more repeats. Regular clientele form a large part of our patronage which benefits not only the franchisee, but also brings more feet into the commercial centres where our coffee cafés are situated. We prefer to select smaller and modern boutique style shopping centres as locations for our coffee outlets. Not only does the upmarket nature of these premises complement our trendy style and approach, but it especially allows us to really show off what The Daily Coffee Café is about and what we offer. The Daily Coffee Group doesn’t stand back when it comes to playing with the other big guns in the market. Having successfully started and managed the first three The Daily Coffee Cafés ourselves, we’ve gained all the coal face (or shall we say coffee brew) experience required to know and understand the requirements of successfully running a business in this industry. And, having already opened the door for a fairy tale ending, the best part is the outstanding, much-loved and largely talked about coffee that The Daily Coffee Café offers. 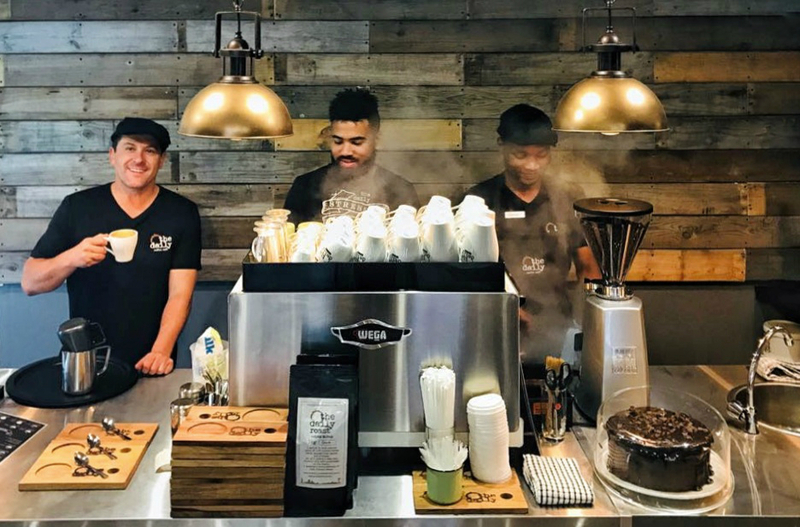 For this reason alone there should be a The Daily Coffee franchise in every city, neighbourhood, town and village – from New York to the Karoo and even further afield. • Use only the best espresso machines and serve only the best coffee. • Serve only the freshest and most nourishing food. • Carefully select the best people for the job and train them well. • Choose the right location for each franchise. • Partner with franchisees that will put their hearts and souls into the business. • Equip and support franchisees to help make them successful. • As franchisor, remain hands on and involved with each business unit. The Daily Coffee Roastery – a division of The Daily Coffee Group – is the supplier of freshly-roasted coffee beans to The Daily Coffee franchises. This roastery, aptly located in South Africa’s tradition-rich Boland region, is a creative space where the know-how, dedication and zeal of our roasters go hand in hand with modern-day roasting precision, together with the unwavering traditional values of the art of coffee roasting. Our hand-roasting process that is linked to automated roast profiles, maintains roast consistency and uncompromised quality in each batch of coffee beans that we produce, yet with the coffee roasters’ personal perfection that only the hand-roasting process allows. The strong emphasis that we place on the quality and taste of our coffee beans ensures that each cup of coffee that our coffee franchises serve, is crafted to perfection. We source the finest coffee beans from coffee producing regions in Africa. 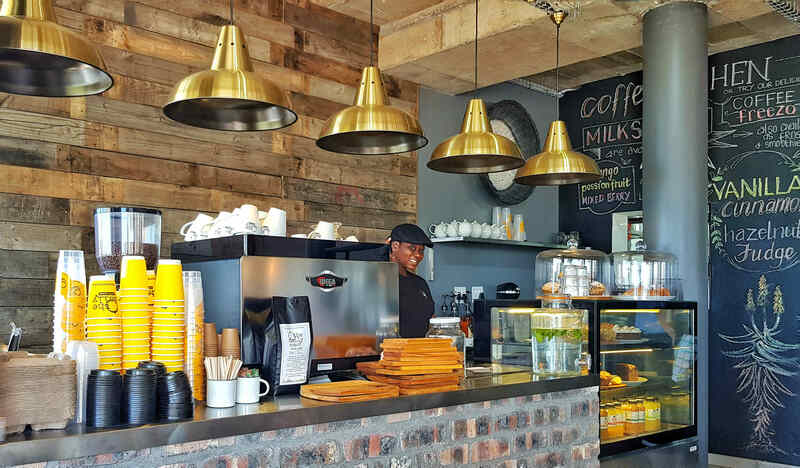 And although the New-York-meets-Karoo décor theme of our coffee cafés says something of the international inspiration behind our coffee outlets, the African origin of our coffee beans confirms where our roots are – right here in Africa! A low initial financial outlay which offers a high return on investment. Franchise fees are not fixed, but linked to turnover. It is therefore just as important for the franchisor as for the franchisee that the franchise is successful and profitable. Turnkey start up with ready to go franchises from day one. This includes finding the best location, shopfitting, installing the equipment, as well as selecting and training of personnel. Point of sale systems that give franchisees full control over their businesses and finances. Skills transfer and backup from the franchisor. Full-time support with franchise management only a phone call away. Becoming part of the already in demand and growing The Daily Coffee brand. Investing in a fast-growing industry where there is an increasing demand for first-class and branded coffee destinations. Although franchise rules exist, the franchisee is allowed a certain degree of freedom to do and implement specifically what is to the advantage of the individual franchise. The franchisor with its experience and authority is directly involved with each café’s lease and other negotiations. Having an upmarket and aesthetically pleasing shop in the shopping centre adds to the overall ambience of the centre. Accommodating a successful franchise business with a proven track record and a long term rental arrangement. Dealing with a franchise group with strong principles and ethical values. As the success of each franchise is of importance to the franchisor, the franchisor will step in in the unlikely event of a franchisee experiencing difficulties so as to ensure seamless continuation of the business and the rental agreement. Each new franchise offers us, the franchisor, an opportunity to offer The Daily Coffee experience to a wider clientele. Not only do we grow our business in doing so, but we give the market what it’s asking for – branded lifestyle coffee destinations. The franchisee’s success is our success. • Stability of their businesses. • Consistency in supply and delivery. • Track record with their other customers. • Price, compared to the value that they add. • A passion to make the franchise work. • Setting high standards with a drive to achieve them. • Full focus on the business. • Business sense and experience. • The ability to use own initiative. We have a deal! What next? • Signing of an agreement. • Selecting a suitable location for the business. • Preparation and outfitting the premises. • Two weeks of training. Kyle Zagrodzky, President of OsteoStrong Franchising, LLC, offers valuble advice on finding the perfect match when shopping for a franchise. Ways to fund your franchise – but the franchisor isn’t one of them! whichfranchise.co.za ™ offers valuable insight into ways of finding finance for your franchise.